we have a lot of atis trees in pampanga. atis--latin name: annona squamosa, aka custard apple, sugar apple, or sweetsop--is the most widely grown of the annona varieties, which include the well-known cherimoya. its origins are unknown, but the spaniards most likely brought from south america and introduced it to southeast asia sometime before 1590.
the fruit is usually 2-4 inches (6-10 cm) long. it is covered in a dull greenish rind and is composed of knobby segments, which break apart easily when ripe. the pink-around-the-edges creamy white flesh surrounds dark, glossy inedible seeds. the soft, scoopable flesh is often compared to a sweet custard in texture and taste, and is best eaten fully ripe and fresh; however, freezing the fruit will yield an instant, portable, creamy, fruity 'sherbet' that is most welcome on hot summer days. Posted by santos. This entry was posted on 20050902 at 12:02 AM You can skip to the end and leave a response. I love this fruit, I remember being taught the Chamorro name as well as the name of chickens and coconut crabs etc.. when I was in grade school. This is one of my top 5 fave fruits. i am from pampanga, too. i miss home. hope you had a good vacation! hi gia-gina! i have to admit, this isn't one of my favourites, but i am learning to appreciate them more. hello cathy--thanks for stopping by! i hope you get to visit home soon. hi gail! i've always been told not to let atis ripen on the tree, they will just fall apart--it looks like you know that well! i have no idea why that happens. 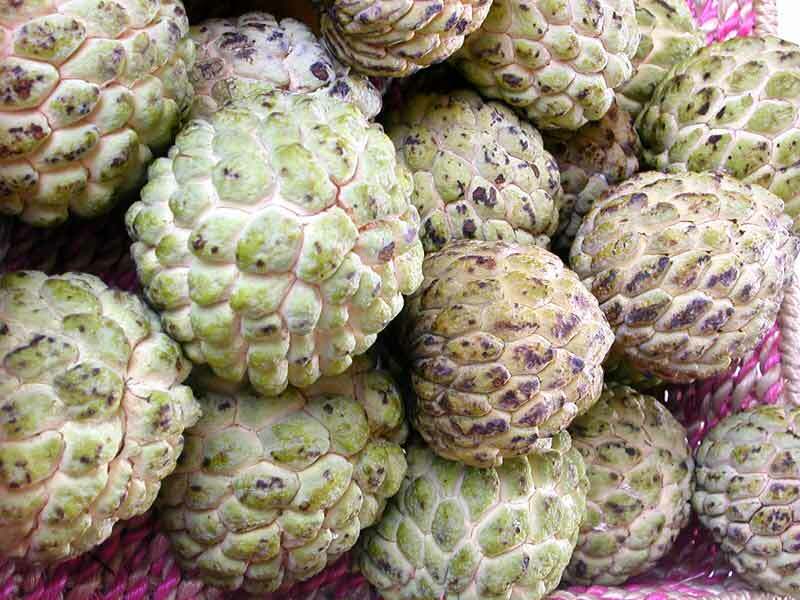 atis are best ripened off the tree, but picked after the whitish/pinky/reddish colour appears in between the segments; otherwise, the fruit will just turn dry and hard. I've had these. They taste so damn good! Have you eer had a sapodilla? They taste like moist, earthy Bosc pears drizzled with honey. hey avatar--sapodilla! we have a couple of fruits related to the sapodilla family, but i don't know what variety is more common on the mainland. there is one they call sapote here, sort of dark yellowish with a creamy custardy center, and then there's a relative of that called chico, which is like a smooth kiwi with a brown, grainy interior that tastes intensely like a honeyed brown sugar. either of those sound familiar? This is my first time posting, but I've been reading your blog for a month now and it's by far my favorite food blog. Being a desert boy, I love all the Pacific fare shown on your site. Thanks for all the fun stuff! Thanks for the advice about ripening off the tree - no one ever told me that before and I wouldn't have figured that out on my own. I am headed out to pick some and will check the inside color. Once I have established the ripeness, I will pick and bring inside. No more wasted atis! hi gail! sorry, i forgot all about the picky picking, but hopefullly that tip will help in the future. hi j! (laughing) you? spitting? fabulous. The second one. Some people also call them naseberries (sp?). hi lisa! i think soursop is something else. or at least, we call another fruit soursop. hm. must get to the bottom of this mystery. hi avatar! i like the second one better myself. thanks for the information! hi maria! can you get them where you are?